Whether the air is there? If everything works correctly, you can not do anything. The main sign of the presence of problematic air in the cooling system is the temperature rise of the motor. When he reached the red zone machine will simply cease to go, losing power completely. And this suggests that the fluid from the cooling system gone through some kind of problem for you. Although the reasons why the cooling system was air can be many and not necessarily what would be so scary it was. Here is how to clean it up. There is a special bolt in the radiator on top of BMW 318i, and on all other BMW E36 of skiving air from the radiator. It should Unscrew, if topped up the fluid in the overflow bottle after a lot leaked. If you add a little liquid, i.e. if at least the third part of the expansion tank was still full, you can not Unscrew the bolt at all. 1. Open the lid of the expansion tank (pic.#8). 5. 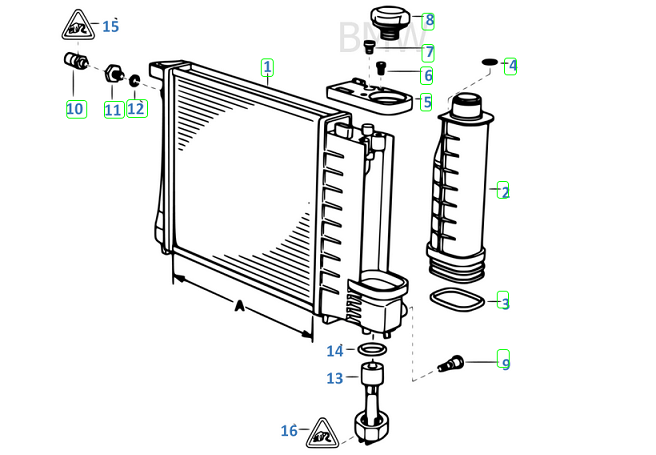 Fill the expansion tank liquid, while unscrewed from under the bolt of the radiator will not go liquid with no air. 6. Screw the bolt venting of the radiator completely. 7. Refill the tank to a liquid level and turn off the engine.